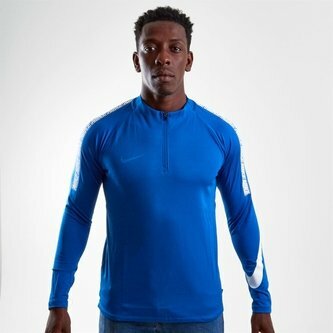 Designed with sweat-wicking material and ergonomic seam placement, Nike's Dry Squad Football Drill Top helps keep you comfortably dry and warm. Made from polyester and elastane, from first touch you're treated to a supremely soft touch against your skin that allows you to move freely from start to finish. The 1/4 design allows for adjustable coverage while thumbholes prevent the cuffs rising up while active. Sporting a calming blue jay look, detailing over the shoulder and on the arm complete the look.